Good morning and welcome to my 38th weekly video, Living With Alzheimer’s. First of all I want to say thank you to everybody who has supported the Cycle Challenge through your donations. I can’t thank everybody personally except for this. We’ve had some businesses come on board, and a number of friends have donated as well. That’s absolutely brilliant. We want to get the figure up as much as possible, and … I can’t thank people enough for what they’re doing for this wonderful cause. Today I want to talk a bit about the … problems with having Alzheimer’s , and the normal simple tasks becoming more complicated. One thing that springs to mind is that this morning my wife asked me to put a stamp on an envelope. I got the stamp out and … couldn’t remember where the stamp went on the envelope. I think I put it entirely the wrong place. … Its difficult. I knew where the stamp went on the envelope, but I knew that I didn’t know. This ties in with a question somebody asked me … ; “do I remember that I forget?” The answer is “yes”. I knew that I remembered where the stamp went on the envelope, at some stage. … But yet I couldn’t remember where it went , so I knew that I had forgotten where it went. But I put it where I thought it went, which was in the wrong place. And that’s the same with remembering whether I am left or right handed. When I’m at the table, or even sometimes when I pick up my knife or fork, I’m not sure if I’m left-handed or right-handed. I can’t remember until I start using the knife or fork. Then I realize maybe it’s a little difficult, and maybe I’ve got it the wrong way around. And I believe I have mentioned once before about signing my name. I can’t remember what my name looks like when I sign it, so I just write my name. Writing is another thing; I can’t remember if I am left or right-handed. Until I pick the pen up in actual fact it feels as comfortable in either hand, until I start writing. Then I realize it’s not quite so easy with one as it is the other. These things shouldn’t be embarrassing, but for somebody like me, they are. … We try to hide/cover these things up, but it’s not always easy. I’ve had a business … I was head of the household and all of that sort of stuff. Now I can’t take two from five. It’s embarrassing because you think that people don’t understand. I suppose some people don’t. But it also becomes very frustrating. … I forget where things are in the kitchen. I forget where they should be. But … some things stay lodged in my mind. Some things never leave my mind. One of the things that I have found … stayed in my mind, is the lyrics to songs. As soon as a song comes on … I can remember the words. It doesn’t matter whether it’s going back to my teenage years … it is there. … You couldn’t do a very simple mathematic sum? … Or you couldn’t make a cup of tea in the right order? … Or you couldn’t remember if you were right-handed or left-handed? … Or if somebody asked you to sign your name and you couldn’t do it? Everybody has silly moments, or “I’ve got a mental block – I can’t think” . Can you imagine what it’s like to do that every day? And to have to live with that all the while. It becomes very embarrassing and frustrating. and a little upset about these things. Putting a stamp on an envelope – as simple as that ! And yet, how complicated can it be ! but it is !! Simple things turn out to be the most complicated things, and that is the frustration!! So what do I do to try and help with this frustration? … One thing is I try not to worry about it. I try to breeze over it, and I try to do the things that I am competent doing. … And I try to do the things that if I make a bit of a mess, doesn’t really matter. Things out in the garden, and cycling – if I get a bit lost, I always get home. Try to focus on the things we CAN do, and not so much about the things we can’t do. Hope todays video has enlightened you about what it’s like, and the frustrations. Not a bad day, … so think I will … do a bit more training for the Cycle Challenge. and I will look forward to seeing you here again next week. If I can’t remember to sign my name, I will say “this is Peter, signing over”. Thank you very much for listening. Bye-bye. * Admin issues: SHARE dementia awareness thru buttons below. Feel free to leave your thoughts in the form of comments, but please filter your comments with truthful loving kindness to all concerned. If interested in receiving notice of future blog postings, subscriptions are available through a “follow” button in the upper left corner (MS Explorer) or lower right (Safari, Mozilla Firefox and Chrome). If there is an advertisement below, I have no control over what is shown. Copyright exclusively by Peter Berry © March 23, 2018 but if there are font changes i probably added them to make it easier to find later. (Final permission March 23, 2018). 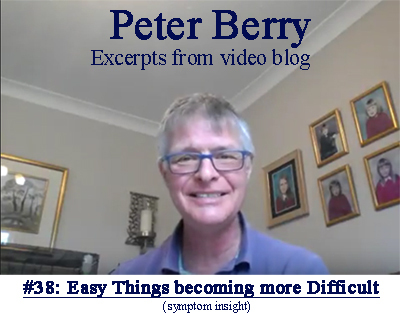 Tags are: alzheimer’s, dementia, frustration, Peter Berry, PLwD, symptom.